It’s amazing how such a tiny fruit can totally change our overall health and help with your lose baby weight plan. The super benefits from blueberries certainly make it one of the most outstanding superfood that you can include into your diet. The high level of antioxidants in blueberries makes it extremely good for boosting immunity and helping with blood flow in the body. Some new research has also shown that blueberries may help with body fat reduction, and they’re also high in dietary fibre which will play an important part in your post pregnancy weight loss plan. You can get even better benefits from blueberries by combining it with other healthy food such as oats or bran. So, here’s an awesome Healthy Blueberry Bran Muffin recipe that is sure to keep your dessert craving in check whilst giving you the benefits of wholesome blueberries. Start by preheating your oven to 200 degrees Celsius. Whilst waiting for the oven to heat up, place paper liners in 18 muffin cups. Throw in all-purpose flour, whole wheat flour, out bran flour, flax seed, baking powder, baking soda, ground cinnamon and salt into a large bowl. Whisk until blended. Mix yoghurt, honey, oil, eggs, orange juice and vanilla in a small bowl. Pour the yoghurt mixture into flour and stir until moist. Chuck in the blueberries into the mixed ingredients, and divide batter equally into muffin cups. 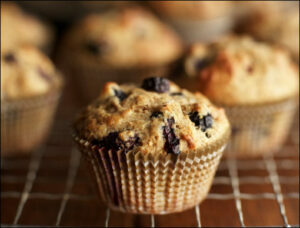 Bake for 18 – 20 minutes, then remove muffins from oven and leave it out to cool on a wire rack. There you go! Quick, simple, easy and healthy! The quick prep time (10 minutes) and baking time (20 minutes) will help you get a nutritious snack in no time at all. If you are ready to lose weight then the Lose Baby Weight plans offer a healthy and safe exercise and diet routine and you can get a 10% discount by using code LOYALTY at the checkout.